The capital of Norway is Oslo. It is a beautiful city situated at the northern tip of the Oslo Fjord. The harbour front at Aker brygge is a busy meeting place, with restaurants, a busy ferry terminal and cruise ships all adding to the scene. The tramway has an urban network, which is a mix of street running, suburban reservations and light rail on reserved tracks and private rights of way, as you will see on this programme. Ruter is the company responsible for the coordination of public transport in Oslo. The tramway is called ‘trikken’ in Norwegian, which is short for ‘elektrikken’ – ‘the electric’. The first electric trams ran in Oslo in 1894 from the city centre to Majorstuen, which is where the Tramway Museum is situated in the former tram depot. The tramway fleet at the time of filming in June 2016 was made up of 72 cars owned by Oslo Vognselskap AS. There were 40 high floor Duewag cars, type SL79, of which the first 10 were assembled in Germany, the remainder being built under licence by Strømmens Voeksted near Oslo. Numbered 101-140 they are all single ended. The remainder of the fleet are 32 Firema/Ansaldo Italian built cars, type SL95, which are very similar to the T69 trams, formerly operated by Midland Metro in the United Kingdom. They were being built side by side at the factory and share many similar components. They are double-ended cars and mostly low-floor. 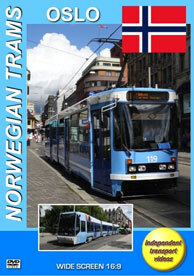 All Oslo trams are painted in a two-tone blue livery with a few different applications of the colours. We have also included the buses on this programme, as they will interact with the trams at a number of locations. The city buses are in an all-over red livery and the regional buses are in an all-over lime green livery all carrying the Ruter fleet names. Most are of Volvo, Scania, MAN and Mercedes-Benz manufacture with a few exceptions. Our filming starts in the city centre where we see the trams operating at various locations such as Tollbugata, Akersgata, Rådhusgata and Aker brygge. Jernbanetorget is a busy tram stop not far from the main railway station where we film the action before riding on tram 116 a Duewag/Strømmen SL79 on line 19 to Majorstuen. Here we pay a visit to the superb Oslo Tramway Museum. We film the exhibits, which range from the first horse tram to the trams of the 1950s. The museum also features a few Oslo trolleybuses that finished operating in the city in 1968. From here we join tram 102, a Duewag built SL79 to Olaf Ryes Plass on Line 12. Here we change to tram 142 an Ansaldo/Firema SL95 to get a drivers eye view on the long ride to Bekkestua, which is outside the city. We then see the busy scene near the bus terminal in the city centre before a ride on tram 129, a Duewag/Strømmen SL79 from the picturesque terminal at Ljabry to the Nationaltheatret on Line 19, observing some interesting single line workings from the drivers eye view. To conclude we return to the city streets to film the trams in action in eleven different locations, and see the buses at Schweigaads gate. We hope you enjoy your tour of Oslo!